Filled with the tastiest Artisan-made snacks from across the state of Indiana, Foodisan is the perfect gift box for the holidays, Christmas or other special occasions, welcoming gifts, new clients or “just because” for the food-lovers in your life. The boxes include a large variety of handpicked local Hoosier snacks that have real character and a story to tell. Shipped directly with a personalized message or branding, these custom gift boxes are sure to make a lasting impression. An assortment of six amazing gourmet snacks made by Indiana Artisans. 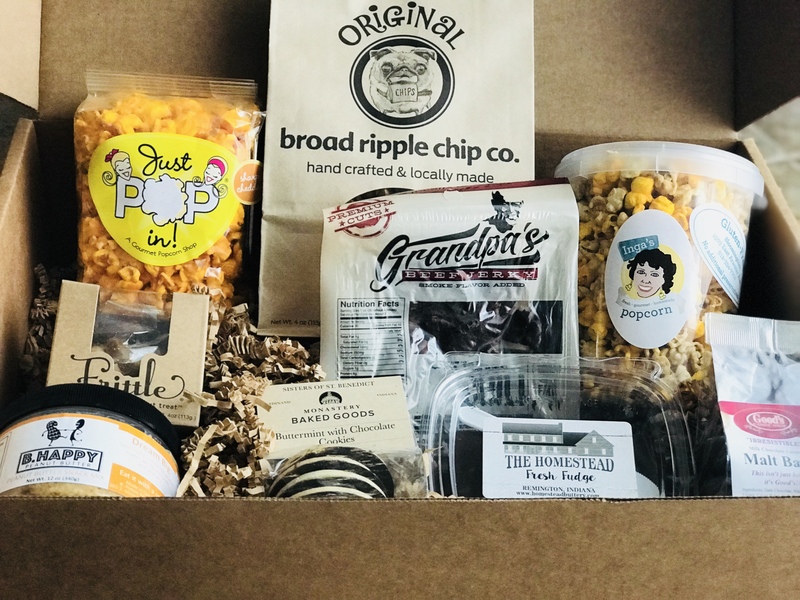 The Small Indiana Box includes a mix of salty, sweet and most importantly, unique and tasty treats. A wonderful assortment of nine amazing snacks from all across Indiana. 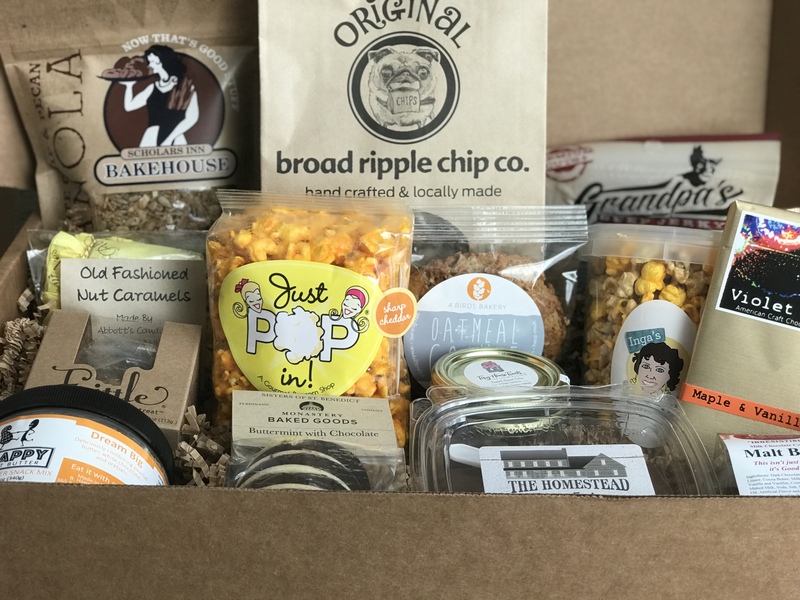 The Basic Indiana Box includes a great mix of salty, sweet and most importantly, unique and tasty treats. These come from Artisans like Newfangled Confections, Inga's Popcorn, and many more. A truly impressive assortment of fourteen fantastic local snacks. Once the box is fully unpacked, your recipient will be in awe of this thoughtful and creative gift. 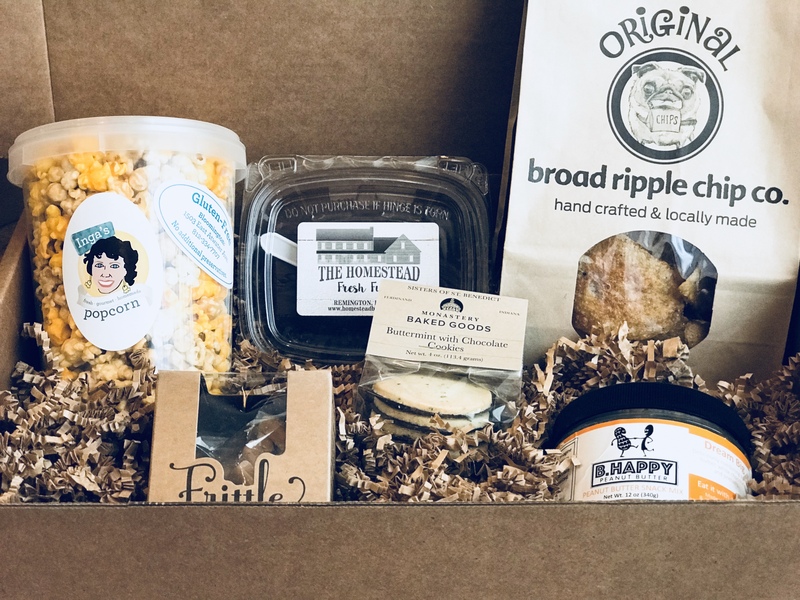 The Ultimate Indiana Box includes a great variety of treats from Artisans like Broad Ripple Chip Company, Just Pop In, 4 Birds Bakery, and many others. Hoosiers are known for their hospitality and caring about their local communities. Our Artisans show their Hoosier spirit through their lovingly crafted, locally made snacks and treats. Giving a Foodisan snack box is a great way to show support for your local community and Artisans. Each box is carefully packed and shipped from Carmel, Indiana, inside a separate shipping box. This ensures the gift box itself arrives in great condition. We can ship directly to you or directly to the gift recipient, it’s your choice. Plus, we can provide you with tracking numbers so you know exactly when your gift has been delivered. There’s no better way to show someone you care than with a truly thoughtful gift. We can personalize it for you in a variety of ways. From a simple and sweet card to an image and personal message on the inside of the box lid, we can ensure the gift recipient recognizes the creativity and care you took in selecting their gift. Yes! I'd like to receive e-mail updates. Stay in touch and learn about the latest Indiana artisan-made treats and gift ideas. © Copyright 2014 Foodisan. Web Design by Springboard Marketing.